Creative Commons and Flickr – a solution found! I’ve written before about the amazing collection of Creative Commons images that are available on Flickr, which are perfect for students (and teachers!) to use when creating any sort of visual content. It is so important that as educators we model the use of Creative Commons licenced materials, because even though we do have some flexibility in education due to various copyright exceptions, if students wish to publish their work publicly these exceptions do not apply. You can read more about Creative Commons if you are new to this term on this previous post on the ResourceLink blog. Unfortunately, the solution which is described in this earlier post, using Greasemonkey to access Creative Commons licence information came unstuck late last month, when Flickr updated their image pages, which ‘broke’ the script. As Cory Doctorow writes in this article about this issue, having no easy access to this Creative Commons licence information is extremely frustrating; such a wonderful range of images, which are so very difficult to attribute puts users off, and certainly sent me off looking to other sources for images when I was putting together some presentations last week. The solution Cory suggests, using the Attributr script available through Github is terrific, but not for the faint hearted. It isn’t easy to navigate Github and get the script working; in fact, after reading this Lifehackr article about Github, I decided to look elsewhere for a solution. Thankfully, Alan Levine, the creator of the original Greasemonkey script that I blogged about earlier, has again come to the rescue! He also has used Github to create a bookmarklet, but the difference is he’s designed it in such a way that it is really easy to use. Simply go to his page (click the screen grab image above to access it), click on the Bookmarklet button and drag it up to your bookmark toolbar. Now, when you go to any page on Flickr which has a Creative Commons Licenced image on it, click on the bookmarklet button, and a window will pop up with all of the attribution information you need! Too easy! This means once again it is so easy to attribute creative commons images found on Flickr – and this is thanks to the work of others sharing their scripts and work generously under a Creative Commons Licence which allows us all to benefit from their technical skills. So thank you Cory Dodt (even though I found your solution too complicated for me) and thank you Alan Levine (Work found at http://cogdogblog.com/flickr-cc-helper/ / CC BY-SA 3.0) and thank you also to all of the other creators who share their work via Open Source or under a Creative Commons licence; together we is bigger than me! 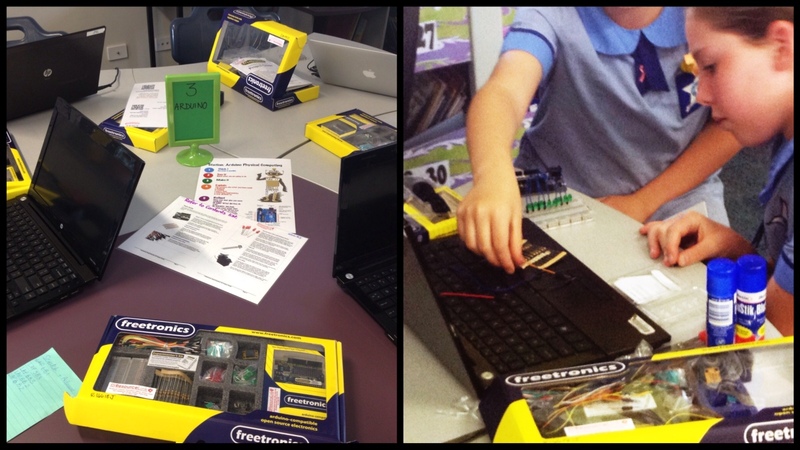 After being inspired by our fantastic day working with Gary Stager and Sylvia Martinez at the Invent to Learn day hosted by Brisbane Catholic Education (which you can read about in the earlier post, Resourcing the Maker Movement, my colleagues and I decided to run a Maker Faire at one of our schools. 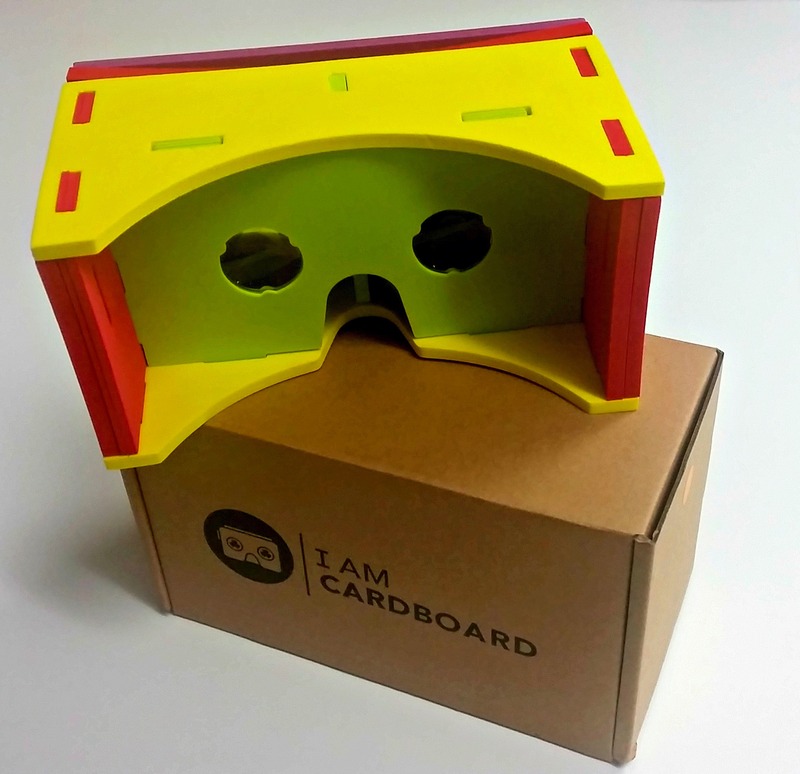 Being based at ResourceLink, I began creating kits of resources and equipment that we could use to run the Maker Faire, and which could then be borrowed by schools who wish to investigate using this style of hands on learning. 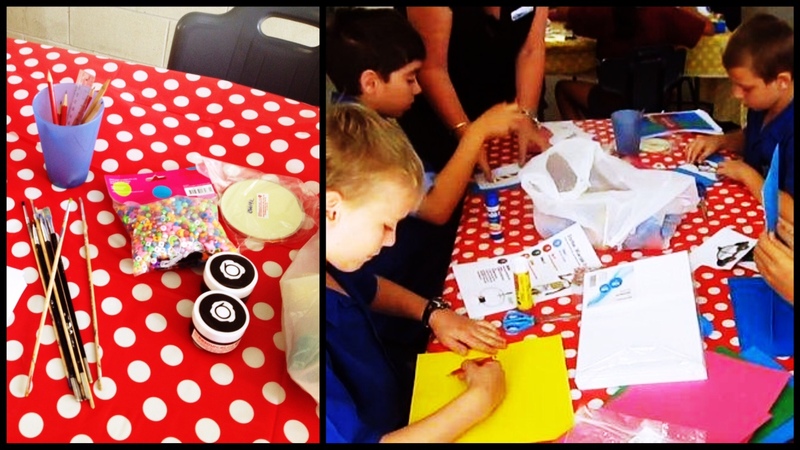 The plan was to run the Maker Faire at St Joachim’s, Holland Park West, where we could work with the Teacher Librarian who had also attended the Invent to Learn day, to introduce the Year 5,6 & 7 students to a range of hands on activities based on the ideas in Invent to Learn. We organised the students into groups of 8, and timetabled them to spend about one hour on each of the activities, which they would rotate through throughout the day. 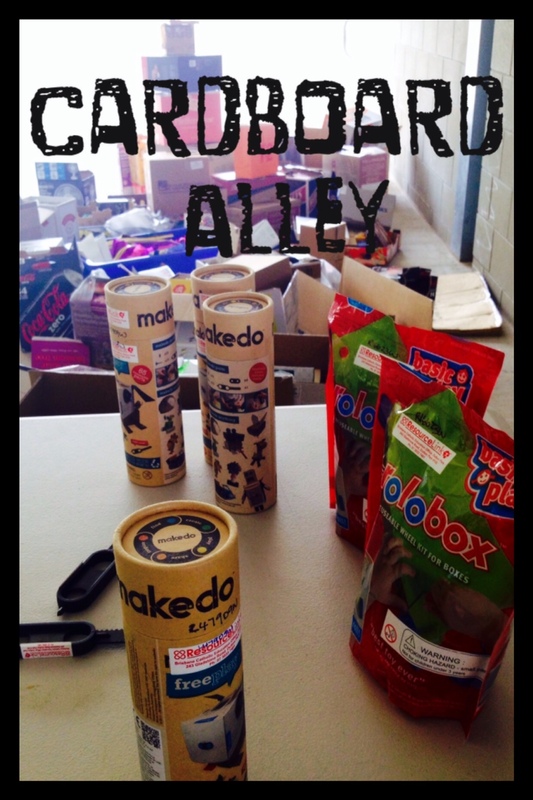 One space, ‘Cardboard Alley’ was open for the students to visit at any stage during the day, and offered the students the opportunity to use Makedo and Rolobox equipment with a huge assortment of cardboard boxes of all shapes and sizes. This was an important option, as it provided students a place to go and recharge if they completed an activity early, or if they just needed a ‘brain break’ from the more challenging activities. 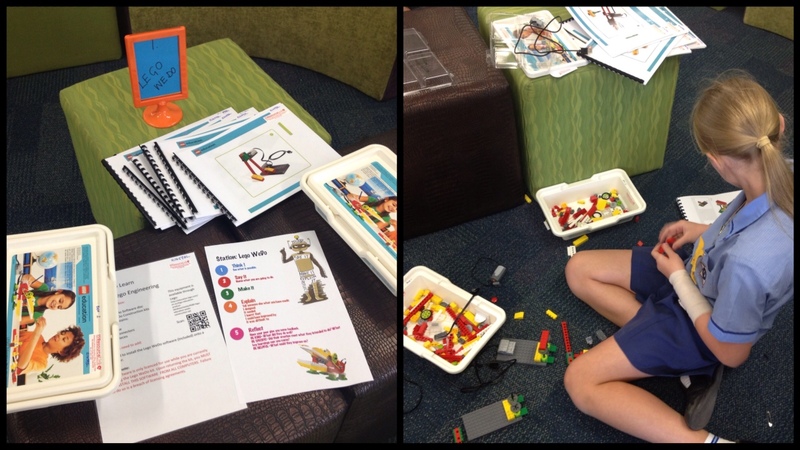 Lego WeDo – an introduction to Lego engineering and robotics, Lego WeDo allows students from Year 3 and up to build and program simple models such as cranes, cars and ferris wheels. Using either the Lego WeDo software, or the free programming app Scratch, students can experiment and develop skills in language and literacy, math and technology, as well as enhance their creativity, communication and design skills. Arduino – Arduino is an open-source electronics platform based on flexible, easy-to-use hardware and software. Using Arduino, students can write simple programs using Arduino open source software to create projects using motors, gearboxes, speakers, LEDs, switches, cases and many other electronic parts.Projects can be as simple or as complex as you wish, suiting users from Year 5 and up. 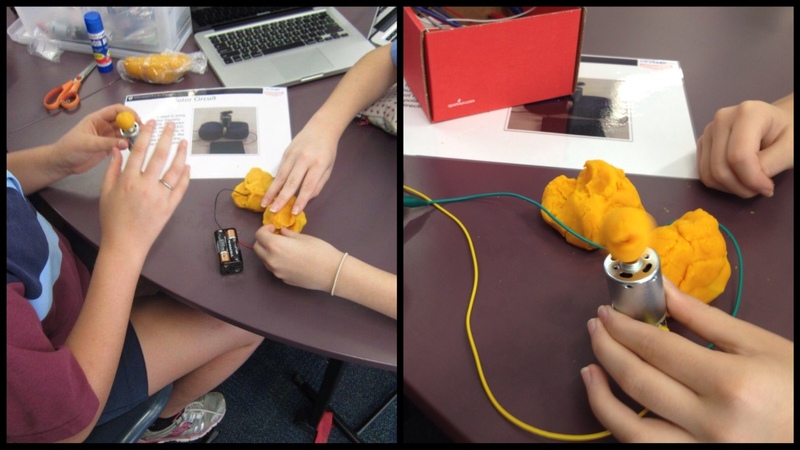 Makey Makey – allows students to turn everyday objects into touchpads and combine them with the internet. Simply use the supplied wires or alligator clips to connect any type of everyday item (such as fruit, plants, coins, play dough etc) to the Makey Makey board, and then plug the board into the computer, and you are able to interact with the computer by way of the attached objects. 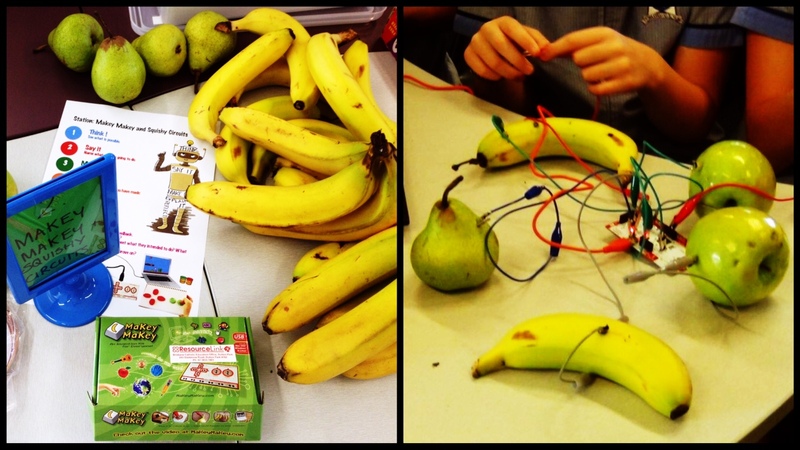 Students love playing computer games using fruit as the controllers! Squishy Circuits– by combining conductive and non-conductive dough with a battery pack, leds, small motors and buzzers, students are able to create innovative simple circuits of any shape. A fascinating way to learn about circuitry and basic electronics. Interactive Cardcraft– students were able to make light up greeting cards by using conductive paint and copper tape along with led lights and small batteries to create simple circuits on the cards. The challenge was to apply their understanding of circuits and switches to the real-life application of the greeting card. Interactive Wearables – Using ideas from this wonderful soft circuits booklet, students created brooches and arm-bands that lit up by sewing circuits using conductive thread, copper tape, batteries and led lights. While the sewing was challenging, so too was the application of their understanding of simple circuits to another practical challenge. When creating the kits for the Maker Faire, I purchased equipment from a range of different outlets. As a library, ResourceLink cannot supply the consumable equipment required for these kits, and so I created detailed lists of what was included and what the user needed to supply in order to run the activity successfully. This information is included in each kit on a laminated card (copies of which you can download below). I also included where possible printable information and instruction cards, which you can download also from the links below. Being based in Brisbane Australia, please note that some of the suppliers are locally based, however some of the online retailers ship all over the world. Links to all of the resources you could possibly need to learn more about Maker Faires and creating maker spaces in a library are available on the ResourceLink Pinterest Board, Makerspaces and STEAM in Libraries or Anywhere, and also curated on this Pearltrees site. For those who want to try running their own Maker Faire, I can only say: Go for it! The learning, the enjoyment and engagement is well worth the organisation, and the equipment is really not as costly as you would imagine. Start small, and build up. You may be surprised at what your school already owns, once you start investigating! 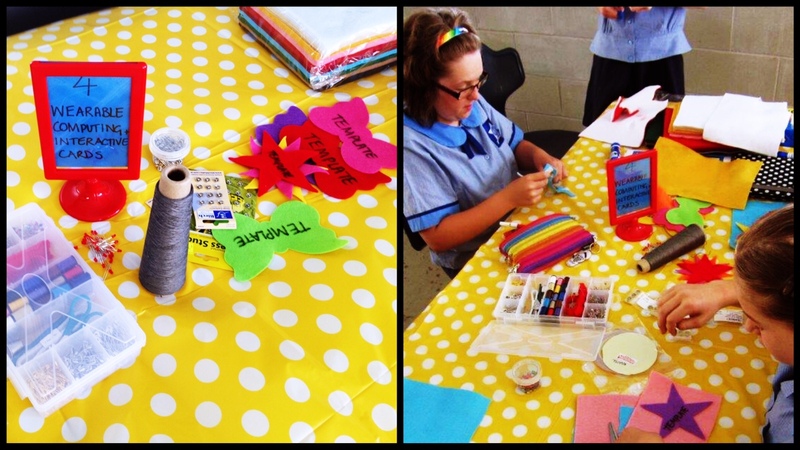 For those in Brisbane Catholic Education, borrow these pre-made kits as a ‘try before you buy’ – contact ResourceLink find out how you can borrow these new resources today! 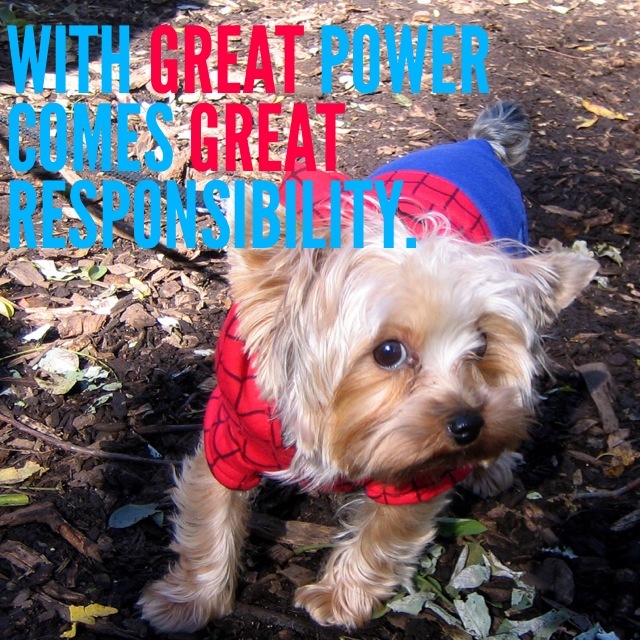 Cybersafety – With Great Power Comes Great Responsibility! Teaching about cybersafety is the responsibility of every teacher. Here in Australia, we are fortunate to be able to access the fantastic services of the Australian Communications and Media Authority, the government authority which has responsibility for the regulation of broadcasting, the internet, radio communications and telecommunications. Part of ACMA’s role is providing cybersafety education through the Cybersmart Program, which is designed to support and encourage participation online by providing information and education which empowers children to be safe online. It does this by providing information and resources for children, teens, parents, schools and libraries, as well as running seminars and workshops free of charge for all of these groups. This is just one example of the terrific high quality video resources available on the Cybersmart Facebook Page. I was fortunate to participate in a day long professional development opportunity run by Cybersmart, which focused on the modules of Booting Up (getting to know students and their digital behavior), Ethical Online Behaviours (promoting positive relationships and exploring how to deal with various cybersafety issues), The Bottom Line (the roles and responsibilities of teachers when dealing with cybersafety) and Plugging in to the Curriculum (ways to connect cybersafety education to the Australian Curriculum). You can read more about this workshop here. This blog post will share the information that I gathered during the Cybersmart professional development day, with links to where you can find more information and ideas. One of the key changes in a contemporary approach to teaching cybersafety is a movement from ‘protecting students’ to students learning to ‘self manage’. This approach acknowledges that prohibition, in the form of blocking sites and banning devices doesn’t work, as students will always get around blocks and filters if they want to. Simply blocking or banning access removes responsible adults from the conversation – it is only when students are using and interacting with technology that opportunities for discussion around ethical and sensible use arise. It is when students are forced to ‘go underground’ with their technology use, that issues have more potential to escalate. The potential to connect, share, create and partake of a world of information is at student’s fingertips. How to use this power responsibly is a skill and understanding that today’s students require, and the message ‘just because you can doesn’t mean you should’ is one that they should hear loud and clear from educators. Through providing students with the opportunity to experiment and take ‘strategic risks’ by using a variety of online tools and devices, students vulnerability to exploitation is reduced – as always, education is the best strategy, enabling students to develop confidence and competence so that if they become involved in an inappropriate or dangerous situation, they are more likely to report to trusted adults and will have more skills to manage the situation. Even with this proviso, kids will be kids, and it is important for adults to be aware of the types of tools they are using and the positive opportunities and potential risks they present. According to our ACMA Cybersafety workshop, the current apps and sites are ‘trending’ among young users. Please note these change frequently! What it is: a huge photo sharing social media site, with over 100 million users – like a visual Facebook. What it is: Send a photo which will ‘self destruct’ after a given time limit to a friend – this is sometimes used to send inappropriate images, as the user believes the image only has a short life on the receiver’s device – however these images may be recorded using screen captures, and then shared with others. What it is: a photo and multimedia blogging site, where users can share images and videos with others and comment on posts – some students are using this as an alternative to Facebook, which is more likely to be monitored by parents. What it is: a social media site where you can create and share videos up to 36 seconds in length, comment on others’ videos and chat with friends. What it is: a site where users can ask each other questions which are completely anonymous. What it is: Similar to Qooh.me, students sometimes share their Ask.fm address on other social media sites such as Instagram to encourage questions from others. What they say: “Kik is the fast, simple, and personal smartphone messenger that connects you to everyone you love to talk to”. What it is: an app that allows users to contact anyone at no cost. Users must know the username in order to initiate a chat with another, however some advertise this information on other social network sites and therefore have many people they do not know contacting them. In many cases, the default settings on these apps generally are open unless the user purposefully goes in and changes the settings, so if students are using these, it is important for them to know about how to maintain their privacy settings; on each and every app. What can schools do to develop cybersmart students? 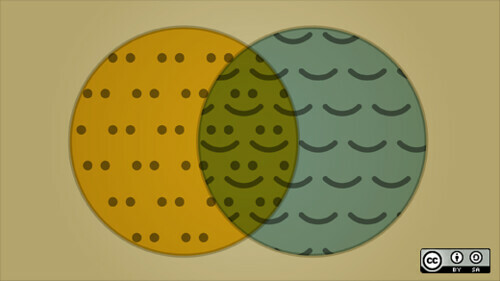 Planning, open communication and positive relationships are all key in managing this area. Even though schools hope they will never have to deal with complex ‘worst case scenarios’ such as students engaging in cyberbullying, sexting or meeting with adult strangers that they have met online, it is important that all staff are aware of the types of behaviours kids can engage, so that staff are prepared to handle the issues if they ever do arise. Two key areas teachers must be familiar with are cyberbullying and sexting. 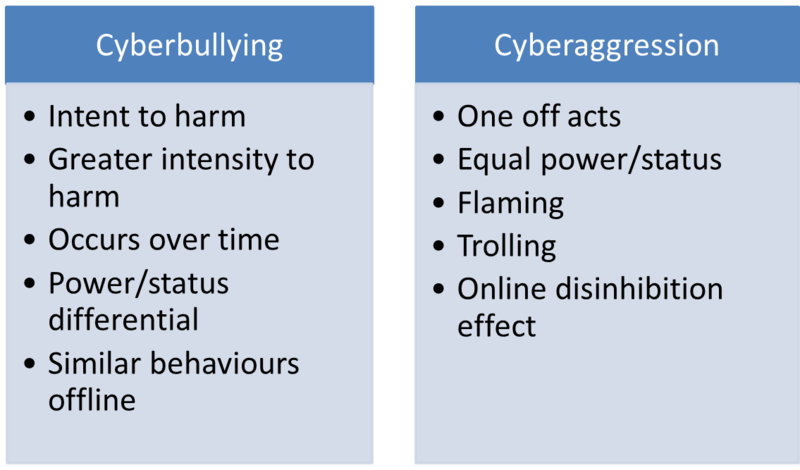 It is important that teachers are aware of the difference between cyberbullying and cyberagression. A lot of behavior is labeled bullying inappropriately, however to deal with these issues effectively, they need to clearly identified, so that appropriate actions can be taken. Donna Cross has done extensive work in this area, and finds that the differentiating features between cyber bullying and cyber aggression are in the intent to harm, whether the act is repeated and how severe the harm is. Sexting is sending another person an inappropriate sexual image, usually of oneself. It is developmentally normal for students to experiment and push boundaries in this area, but the increase in the act of sexting is due to exposure to our highly sexualized media and in response to peer pressure. It can also be a test of power or trust in a relationship, or may be a sign of a teen displaying at risk behavior (a sign that they are looking for help). Most common scenarios are between romantic partners (or those they hope to be romantically involved with) and exchange between partners that are then shared beyond the couple. It is important for teachers and parents to respond in a way that doesn’t demonise technology, and to explore underlying issues, but it is vital that students understand the implications of these actions, especially as they currently carry the possibility of criminal convictions. You can read more here. The Cybersmart program provides a wide range of resources for students, teachers, parents and libraries. 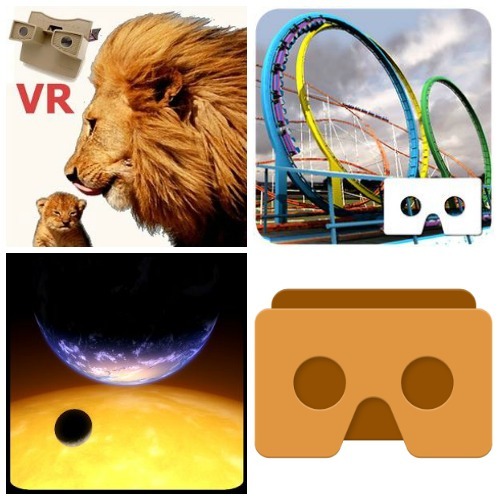 These include interactive online activities, videos, workshops, physical resources and more. Teaching about being cybersafe also fits well into many of the General Capabilities outlined in the Australian Curriculum, particularly Information and Communication Technologies, Critical and Creative Thinking, Ethical Behavior, Personal and Social Competence and Intercultural Understanding. For those within Brisbane Catholic Education, a range of Cybersmart resources will soon be available for loan through the ResourceLink library. All schools throughout Australia may order these resources for free from the Cybersmart website here. Please take the time to check out the excellent Cybersmart Website, and think seriously about developing a cybersafety curriculum for your school – the possibilities of technology are wonderful, but as Spiderman says, with great power comes great responsibility! To many in Catholic Education, Greg Whitby is better known as the Executive Director of the Parramatta, however his passion for 21st century learning, and for changing schools to meet the needs of today’s students is known to any who read his blog, Bluyonder, or follow him on Twitter (@gregwhitby). He has crystallised his thoughts on this in his recent publication, Educating Gen Wi-Fi, which extensively describes the challenges for schools who still operate in the ‘factory model’ of the 19th century, and some ways in which some schools have answered this challenge. With extensive case studies and chapters addressing who today’s learners are, learning spaces, assessment and parents as partners in learning, it is an easy to read book for anyone interested in education, but specifically for those who are keen to make a change to their ways of operating in the school arena. The book begins with a whirlwind tour of the development of education from Ancient Greece to present day. Whitby challenges readers with the fact that ‘we cannot continue to deliver an ‘analogue’ 20th century curriculum when the world is ‘digital’, exploding with information that can be accessed by increasingly smaller and more powerful mobile devices’ (p.50). Whitby speaks about the use of digital tools to share learning to a real and worldwide audience, and the ability to harness this sharing of learning through the development of Personal Learning Networks via platforms such as Twitter. He explores how students today need to be critical thinkers and be able to analyse, evaluate and remix information in order to solve problems. As technology has flattened our world, there is an increasing the need for global literacy, as we work and play with others across the world. The increased use of technology brings about challenges for schools, one of which is the need to develop a sense of digital citizenship within students and staff. The common solution for many schools faced with issues of cyberbullying and distraction by social media is to ban access to sites and tools such as mobile phones. Whitby argues that this is forcing an old model onto new learners – and that the connected learners of today should be encouraged and indeed able to use the tools that are most natural to them in their learning. He argues it is up to teachers to develop their skills and comfort levels with technology, and to harness these powerful tools that students use so naturally in their everyday lives. The diversity of learners in schools today is one issue that is handled very well with technology. It allows teachers to collaboratively construct curricula that meets the needs of learners at a variety of levels, and indeed Whitby even suggests that the learners themselves should have input into what and how they learn – something leading educators such as Ewan McIntosh, and his work with Design Thinking echo. It’s not just a room full of computers and tablets that makes for 21st century learning. Whitby makes it clear that it is the relationships between teacher and student, and the strength of the pedagogy that truly makes the difference. He bases these claims on the work of John Hattie, as well as his personal experience of over 30 years in education. Teachers should embrace new technologies as just another resource in their arsenal – and let student learning drive the focus rather than technology. When it comes to assessment, Whitby is a great proponent of learning portfolios, and questions the place of external exams such as Naplan. Rather than focusing on teaching to the test, he believes that students who are encouraged to develop their critical thinking and creative skills through broad and engaging pedagogy will enable students to achieve in all manner of assessment. He is also quite critical of how the media and public relations generally focus purely on academic results, ignoring the many other terrific achievements that occur in schools, as well as the achievements and contributions made by those students who do not follow the academic path, but choose a vocational route. Emphasis on traditional areas of education such as numeracy and literacy narrows the focus and denies the outside world a true view of the many areas schools support. Another area addressed by Whitby and one that is mentioned frequently in the research around contemporary learning is the influence of open and flexible learning spaces, which allow teachers and students to work collaboratively and in many different ways. A number of case studies illustrate how schools can be redesigned physically to allow students and teachers to escape the four walls of the traditional classroom. He writes also about the positive impact of close collaboration with parents, and how new tools including social media can be used to communicate and inform parents. Whitby closes the book by reviewing the commonly held myths about the type of change in educational landscape he is suggesting. Responses commonly heard in the media and in carpark gossip including ‘it’s been done before’ and ‘the curriculum won’t allow it’ are addressed comprehensively. He suggests that hard questions need to be asked, and that for schooling to change, we must once and for all move beyond the information transmission model, a model that is clearly outdated in the age of Google. cc licensed ( BY SA ) flickr photo by alexanderdrachmann: http://flickr.com/photos/drachmann/327122302/ edited with Instaquote. This book is an excellent overview and introduction to the challenges facing schools today. While some educators who remain informed about changing technology and who are actively implementing new ways of teaching and learning in their schools will find nothing new, for those who are just beginning the journey, or who want to find the words to express the impact of these changes to others, it is certainly a worthwhile read. The evidence he provides through the many case studies demonstrates the amazing things that can be achieved with creativity and vision, and hopefully schools will continue to take on this challenge and provide engaging, relevant and rigorous learning for this connected generation of students. Now the previous post has given you an overview of the basics for creating a great presentation, the following information will focus on ‘how to’ actually produce it. Your first decision when creating a presentation is deciding which tool best suits the purpose. The main players for presentations are PowerPoint (Windows), Keynote (Mac) and Prezi (Online). There are also mobile apps that create presentations, which are useful if you are on the move. PowerPoint is the best known application in this area. Superb presentations can be created using PowerPoint – Nancy Duarte has created an amazing example of just how far PowerPoint can be pushed, which can be viewed here. PowerPoint is easy to use, although it can sometimes be a little unreliable when embedding video, (more on this later) and many of its pre-designed themes and templates are less than appealing. Keynote is only available to those operating on the Mac platform. It performs the same role as PowerPoint, however some argue its design is sleeker and it is known to be able to handle video and music files more capably than PowerPoint. Click the image to go to a Prezi presentation explaining Prezi in further detail. Prezi is a relative newcomer, but it is growing in popularity. Prezi is online, and stores your presentations ‘in the cloud’, although for a modest subscription you can download a desktop editor, which allows you to work in an offline mode. Prezi is not based on linear slides, but has an unlimited canvas, onto which you place your content. As you design your Prezi, you create a ‘path’ which directs the order in which this content is presented. Being a canvas, Prezi is terrific for creating non-linear presentations, as you can zoom in and out to view the big picture or focus on smaller details, and the design is not limited by slide size. A tutorial on getting started with Prezi can be downloaded here. Click the image to view a brief Prezi on what Prezi is all about. A beautiful mobile device presentation app is Haiku Deck. The focus of Haiku Deck is to create image based slides, with minimal text. Built into the app is a search of Creative Commons licenced images, and it automatically places the attribution onto the image, which is a huge time saver. If you have access to an iPad, it is worth exploring. Below is an example of a Haiku Deck slide. Avoid using the standard templates, if at all possible. There are a number of reasons for this. Firstly, they are not original or memorable. As PowerPoint is used so commonly, the layouts will make your slides seem just like everyone else’s. Secondly, the templates provided encourage the creation of slideuments – encouraging headings and subheadings, dot points and even two columns of information on the one slide. Example of an Ishihara color test plate. 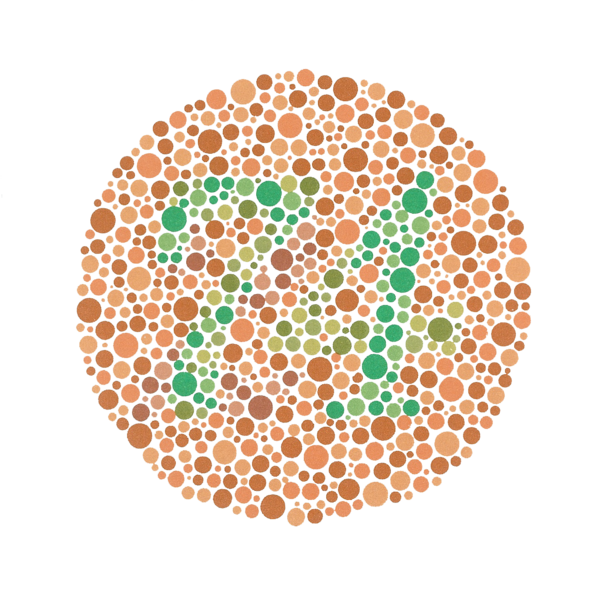 The numeral “74” should be clearly visible to viewers with normal color vision. What looks amazing on the computer may not display as well when projected on a screen. The size and brightness of the room and strength of the projector can impact upon the colours, rendering some colour combinations unreadable. Another consideration is that approximately 8% of men suffer from colour-blindness (Victorian Department of Health and Safety,2013). Therefore the choice of background colour, text colour and the use of contrast are all important. The vast majority of images found through Google Images are copyrighted. When presenting to an audience, replicating images you do not have permission to use breaches copyright. Fortunately, there are a number of sources of images you can use, and these sources are growing.Creative Commons licenced images are an alternative to copyrighted images. Whereas copyright works on an all rights reserved model, Creative Commons licences allow the creator of the work to state which rights they choose to reserve (e.g. non-commercial indicates the creator reserves the right to prohibit commercial use of their creation). Images can also be labelled Public Domain, which means anyone is free to use them. 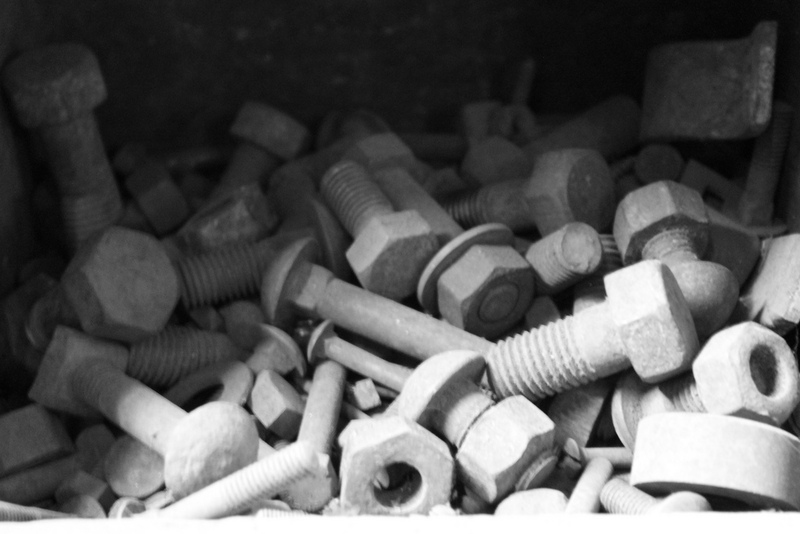 These images are usually commonly used symbols, or images that have passed out of copyright. A comprehensive explanation of Creative Commons, Public Domain and Copyright is available on the Copyright and Copyleft wiki. 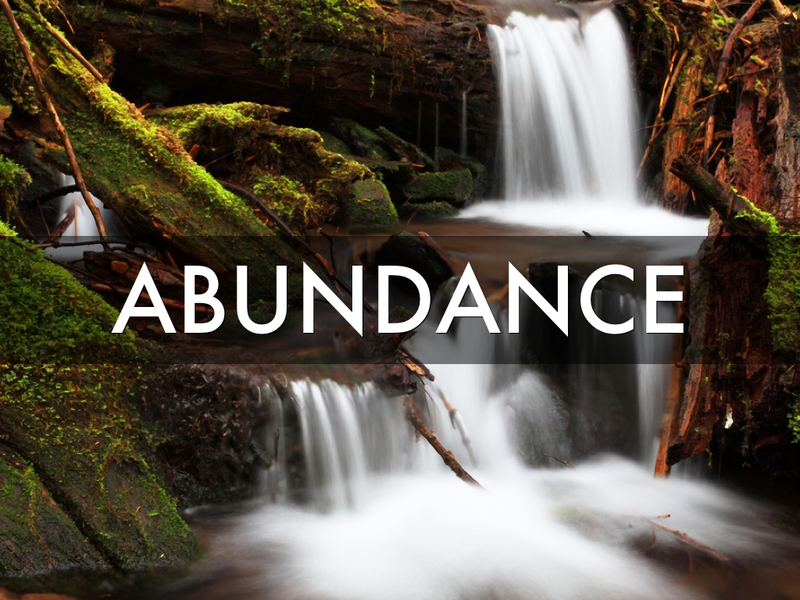 If you have a budget for the presentation, you can purchase images from one of the many stock photo companies online. 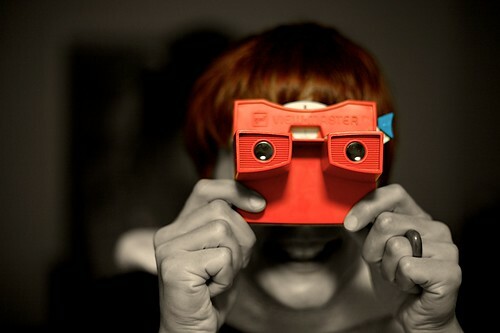 We have found iStockphoto to have an excellent range, and reasonably priced. If you have no funds, don’t despair! There are many other excellent sources of creative commons licenced and free images and quality clipart. Flickr Creative Commons – a huge range of photos all licenced to be used under various CC Licences. Wikimedia Commons – a database of over 16 million freely usable media files to which anyone can contribute. Clker royalty free public domain clip art in vector format and in image PNG format. It also allows you to make simple edits to these images. Inserting video in PowerPoint can be problematic. 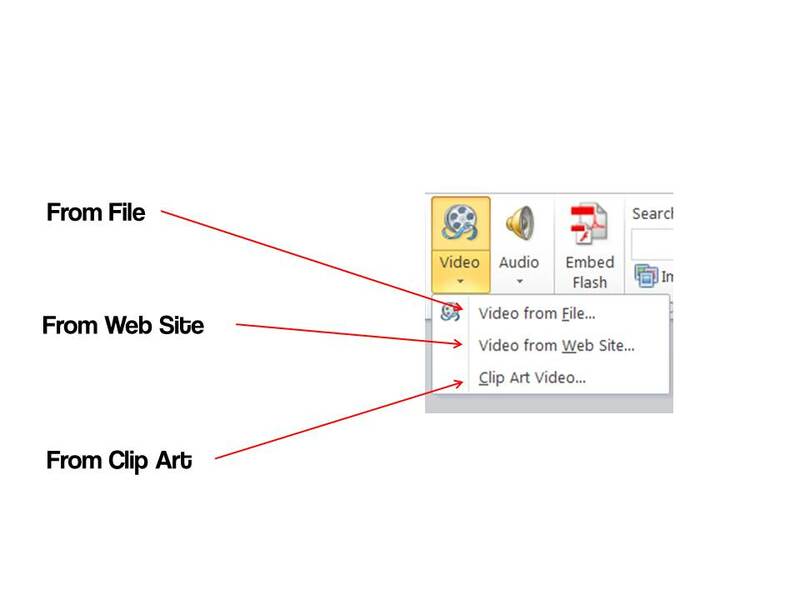 PowerPoint offers three options for inserting video. Inserting a video from file is essentially the same as inserting an image. You browse to where the file is located, and click insert. There are a number of caveats on this simple process. a) Keep the video file and the PowerPoint file in the same folder. The video is not embedded into the PowerPoint, it ‘links’ to it, so if you move the PowerPoint (say onto a data key to transport to the presentation location) and you don’t move the video file as well, the video will fail to load. Moving the entire folder with all linked files goes some way to resolving this (although it is good to test at the presentation location, as sometimes videos need to be ‘reinserted’). b) If you have a video stored as a file on your hard drive, you should either own this video or have permission to store it. Downloading YouTube videos without the permission of the creator is a breach of copyright. Step 1: Copy the embed code from the video you wish to include. Note you must choose the ‘old embed code’ option. Step 2: Paste into PowerPoint in the appropriate field under Insert Video from Website. This process has never worked successfully for us, on a range of different computers. The video appears as a black box that will not play, or there is an error which requires Adobe Flash to be updated (even when the latest version is installed). Hyperlinking to the video means you temporarily leave the presentation, and go to where the video is situated to view. This can be disruptive during a presentation, however it does mean you can link to any video on any website (YouTube, Vimeo, TeacherTube etc). You can also link to a video edited on SafeShare TV, so that all of the annoying ads are removed. A tutorial on how to hyperlink to Safeshare TV can be downloaded here. A third party plug-in such as AuthorStream allows you to embed YouTube or Vimeo videos directly into the slideshow so that they can be seamlessly displayed as part of the presentation. Download Authorstream and follow the directions to install. Once it is installed, in PowerPoint a new tab will appear on the ribbon at the top of the screen. 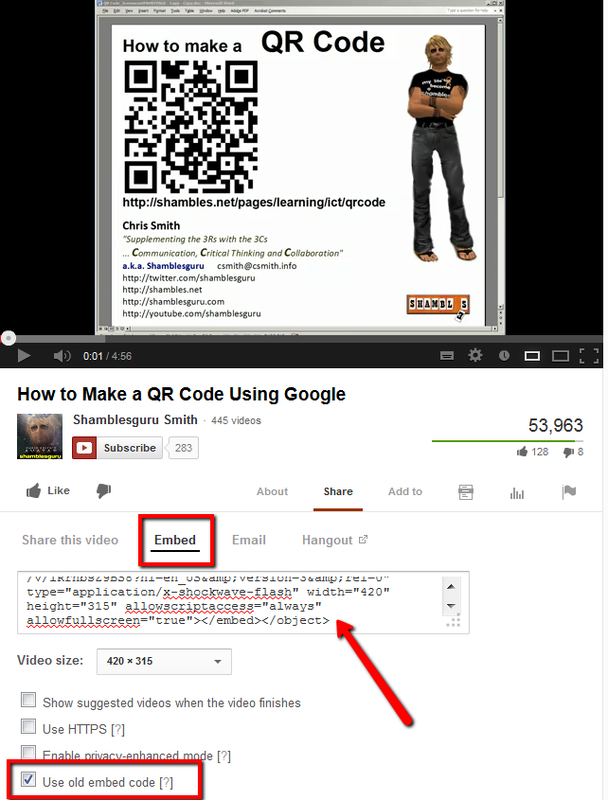 Embedding the video is simply a matter of pasting the video hyperlink (not the embed code) into the window, as below. Please note that embedded videos require an internet connection to operate. Embedding video from clipart is quite straight forward, however the limited range of videos available from clipart means this option is rarely chosen. The videos available are generally classified as animations, and add little to formal presentations. If you have many videos to embed, it may be easier to choose Prezi as your presentation tool. To embed video into Prezi, simply paste the link where you want the video to appear, and as long as you have an internet connection, the process is complete. Choice of font is essential if you wish to have readable slides. If at all possible, choose no more than two fonts; a headline font and a text font. Make use of bold and italic options if you need further differentiation. Nancy Duarte explains font choice very well in her book, Slideology. Essentially, there are two types of fonts; serif and sans serif. Once you have selected the font, don’t make the mistake of keeping it too small. Even though it may be readable on the computer screen, once projected this may change. As a general rule, stick to 24pt and above, larger if you are presenting in a large room and some audience members may be seated far from the screen. (click on the logos to go to the sites). One thing to note if you are using downloaded fonts – they will only work on the computer where the fonts are installed. This is vital to know, as many presentations are created on one computer and transferred for presentation onto a different computer. If you know the presentation is going to be moved, it is best to stick to one of the pre-installed fonts, or save the presentation in PDF format, which will prevent the fonts from changing no matter what computer is being used. Avoid the overuse of bullet points! These two posts on creating presentations that work have drawn on the work of several experts in this area; Nancy Duarte, Garr Reynolds and Seth Godin. A full bibliography of references used is below for further reading and information. Duarte, N. (2008). slide:ology: The Art and Science of Creating Great Presentations (1st ed.). O’Reilly Media. Godin, S. (2001, January 10). 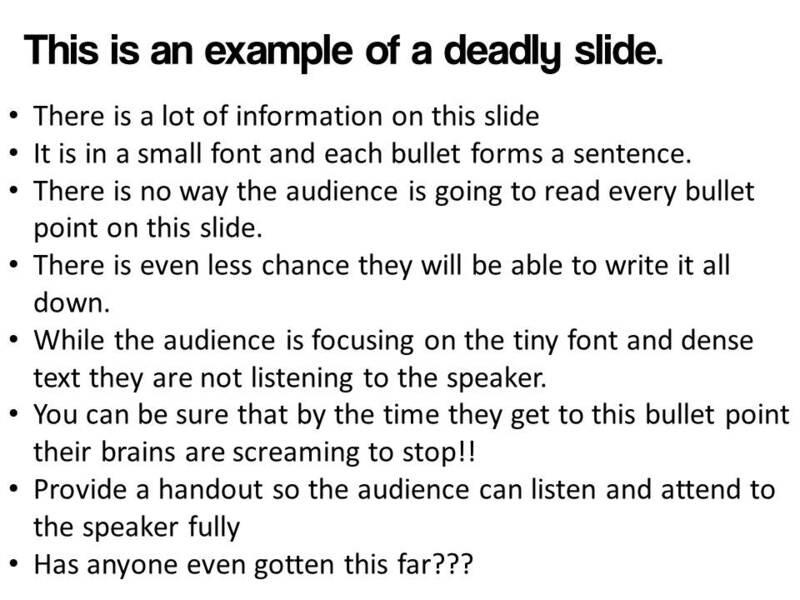 Really Bad PowerPoint: (and how to avoid it): Seth Godin: Amazon.com: Books. Do You Zoom Inc.
Reynolds, G. (2011). Presentation Zen: Simple Ideas on Presentation Design and Delivery (2nd Edition) (2nd ed.). New Riders.